When patients call our offices the first question we usually get asked is, “how much do dental implants cost?” Dr. Templeton has been placing dental implants since 1996 and over the years he has recognized the two biggest obstacles to patients getting dental implants. They are money and fear. We have the “fear” issue figured out as 99.9% of our patients elect to have some degree of sedation and therefore aren’t completely conscious for the procedure. That’s the easy part of the equation. Let’s address the “money” issue. We’ve got families to provide for as well and we know how difficult it can be to juggle all of your financial needs while making a budget for dental implants. However, we think you’re going to be very pleased with what we have to share with you. 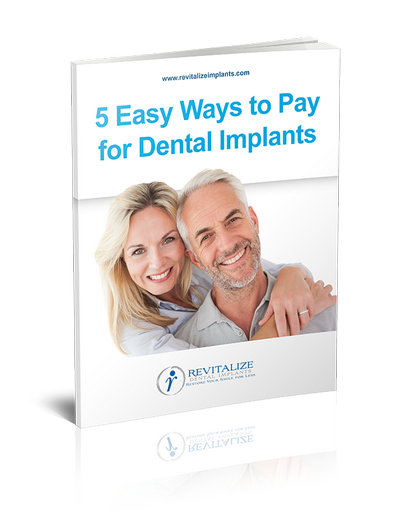 Dental implants might just be more affordable than you think they are. Before we start jumping into numbers we want to encourage you to look at the cost of dental implants as an investment instead of an expense. Let’s address the ‘money’ issue. The costs we’re about to outline pertain to the average patient. Every case is unique, however, so actual costs will vary. That is why an initial consultation is so important. During the consultation our patients are provided a thorough breakdown of the fees and costs so they not only know the total cost but how we came to that figure. The actual implant: the implant is a titanium threaded post that is very carefully placed in the bone to replace the root of the tooth. 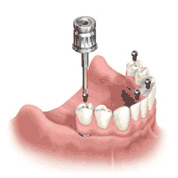 The abutment: the interface between the implant and the actual tooth or teeth. Abutments come in many different shapes, sizes, angles, and price. The cost for a single tooth replacement is determined by implant, abutment, and crown. A cone beam 3D CT is taken to determine if the patient has enough bone and adequate density (hardness) to have an implant placed. Sometimes the implant and bone graft can be performed at the same time to save the patient time and money. Some patients are only going to need a single implant, whereas others will need several because they’re missing multiple teeth. In those cases All-on-4 dental implants are the best solution. All-on-4 dental implants, or often referred to as “teeth-in-day,” are game changers when it comes to calculating the costs of dental implants. The All-on-4 procedure is about doing more with less. With All-on-4 dental implants, 4 to 6 implants are placed per arch. A single arch supports a full set of teeth, typically 12 teeth. Full arch implant bridges, or All-on-4 type restorations, typically cost anywhere from $15,000 up to $30,000 per arch. We offer a full arch All-on-4 dental implant starting at $10,000 – about half what other dental implant specialists charge! Our pricing model allows our patients to have both their upper and lower jaws restored for the cost of what it typically takes to restore a single jaw! The best way to find out what your implants will cost is to have an initial consultation with Dr. Templeton. We are currently offering an initial consultation for only $75. Dr. Templeton will use the 3D scan image during the consultation to determine the density of the bone and to see whether you’re a candidate for an immediate implant or if additional grafting will be needed prior to implant placement. While determining the costs of dental implants is an important first step, don’t discount the experience of the dental implant specialist you choose to work with. Dr. Templeton has over 20 years of experience and training in placing implants. He spent eight years at the OU Health Sciences Center in OKC learning how to diagnose, treat, and place dental implants. He has been placing dental implants since 1996 and has been a leader in CT guided (less invasive) implants since establishing Revitalize Dental Implants in 2009. Extensive pursuit of continuing education beyond eight years of formal training keeps Dr. Templeton up-to-date with the latest advances and technology. When you choose Dr. Templeton to place your dental implants you not only get the most competitive prices on dental implants, you also get an experienced dental specialist in your corner! Don’t let price fears stop you from getting the implants you need! Book an initial consultation with Dr. Templeton and find out exactly what you need done and what it will cost. Dr. Templeton and his staff will put together a customized treatment plan for you and present all financing options to help you get the smile you deserve! Click Here to Schedule an Initial Consultation Today!